At the beginning of the game. Zhang Jiao gets X Yellow Turban Tokens. X is the number of players in the game, with a maximum of 12. When any player is damaged, Zhang Jiao can discard X Yellow Turban Tokens to negate X units of damage. 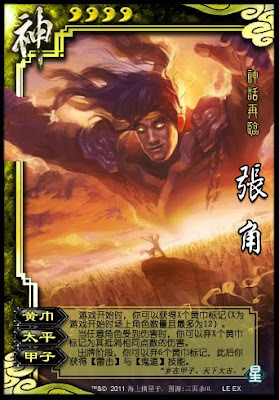 Once per game, during his turn, Zhang Jiao can discard six Yellow Turban Tokens to acquire Lightning Strike and Dark Magic for the remainder of the game. "Lightning Strike" and "Dark Magic" are the powers of the normal Zhang Jiao.